Hey, to me it's still a planet. So it's a dwarf planet; that doesn't matter to me. A red dwarf is still a star. Anyway... I am not trying to continue that debate here. Instead, I'd like to show you an incredible image taken by my friend, John Chumack, from Ohio. It is of Pluto crossing in front of the dark nebula Barnard 92. 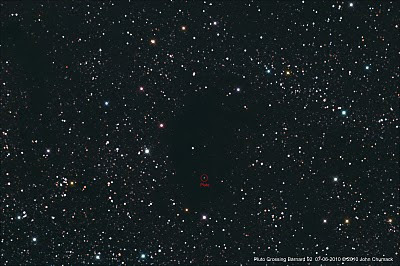 This chance passage made it much easier to pick out Pluto among the rich star field of M24 The Sagittarius Star Cloud. This is one of the things that makes John such a great astrophotographer. Researching and grabbing great shots like this. This image was taken from John's observatory in Yellow Springs, Ohio, using John's homemade 16” Newtonian telescope and a QHY8CCD single shot color camera. The Exposure was 1 hour (12-5 minute subs) captured from 01:00am until 02:00 am E.S.T. on 07-06-2010. 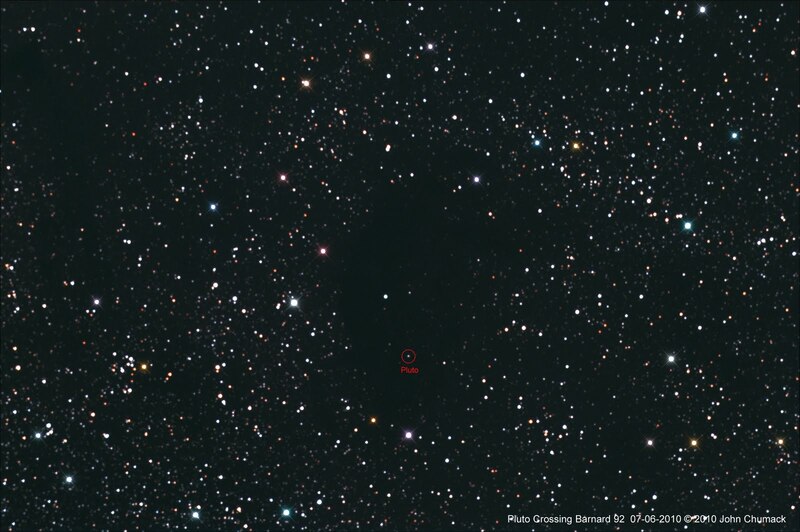 John writes, "Although Pluto was easily visible in a short 5 minute exposure, I took an hour exposure to show the Dark nebula and 'Rich & Pretty' surrounding star field." Click to enlarge- really- go ahead, it's pretty cool.